What happens to most of our PET bottles? What is the largest end-use market for recycled PET plastic (called rPET) in South Africa? Polyester stable fibre. Propet is a polyester fibre manufacturer which produces fibre from recycled PET plastic bottles. Did you know that Propet is committed to cleaning up South Africa’s landfill sites by converting waste into high quality polyester fibre and promoting sustainability within the country? Last week some key stakeholders were able to go on a site visit to PROPET, organized by PETCO, The PET Plastic Recycling Company NPC. 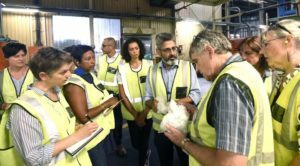 The attendees* were able to see the production of polyester stable fibre, the largest end-use market for recycled PET, or rPET, in South Africa. They produce a wide range of fibre types and supply their products to the entire textile industry, including sectors like geotextiles, home textiles, medical textiles, nonwovens, automotive, apparel, industrial and hygiene. The tour started with an introduction by PETCO CEO, Cheri Scholtz. 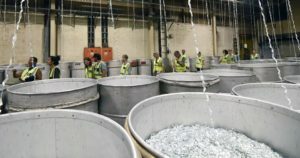 Scholtz said, “This plant was originally a virgin plastic factory and was recycled to become a plastic recycling plant.” Joint Managing Director of Propet and Extrupet, Chandru Wadhwani spoke about the landscape of recycling in South Africa. 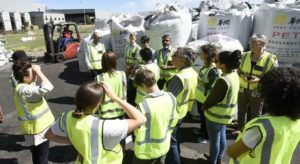 Wadhwani said, “South Africa sustained recycling after China said no to being the landfill for the world’s waste.” After which he gave a tour of the plant, explaining how the process of making polyester fibre starts off its life as a plastic PET bottle. The way that bottles are designed will determine what they can become. Green and Brown bottles have been recycled for many years – you make green, brown and black fibre from it. However, there is a limited market for those colours, and hence not ALL of them get recycled. Collectors get a higher price for clear bottles, and so are more likely to pick a clear bottle and leave a coloured one behind, unless they have space to transport it. The best way to ensure that they do get recycled is to make them clear. What doesn’t get recycled at all, are the white, luminous yellows, reds, and black bottles etc. Apart from there being no market for them, the masterbatch used to make those blocks up the fibre spinnerets and fibre can’t physically be made from them. 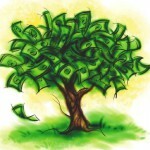 So recyclers often have to go through the cost of shredding them and dumping them back at landfill. So how does a PET bottle eventually become polyester stable fibre at Propet? The process starts with the collection of bottles. Every year millions of bottles are collected, either by private services, individual reclaimers or municipalities. Daily in 2017 6 million bottles were collected and compressed into huge bales this. This makes it easier to transport to the recycling plants. At the Extrupet recycling plant, in Beaconvale, the bales are fed into the sorting machine where they are broken apart. 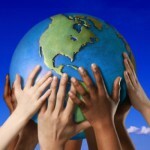 Then any metal or other materials that could contaminate the recyclate are removed, including other types of plastic. Then the remaining PET is colour sorted by hand – each colour is separated into its colour stream. Any other bottles that have made it through that are not PET also get discarded here. The bottles are then crushed into small flakes– these flakes still contain ground up lids and labels. Next is the washing process, where the flakes are subjected to a large tank of water. In a PET washing line this tank is often called a float/sink separation tank. PET flakes have a density greater than water and will sink to the bottom whereas the other materials will float. Washing also removes contaminants like glue, grease, leftover food or dried liquid. This leaves behind clean, pure PET flakes. The flakes are then transported to Propet, where they will arrive colour sorted into the different streams e.g. clear PET flakes, green PET flakes etc. The flakes are dried and extruded into long plastic strands, then they are chopped into short pellets. They are now ready to be made into fibre at the Propet plant. The pellets go through a process where they are pushed through tiny holes that turn them into tiny spinnarette. Each spinarette pushes out hundreds of individual filaments, which are then cooled and combined into a single rope called a tow, made up of thousands of individual polyester fibres. Ultimately to make the polyester feel more organic, the fibre is treated and crimped – resulting in fluffy fibre with a luxurious texture. The fibre is then packed into polyester bales and is ready to be used in the production of many new products. Not only does Propet make polyster stable fibre. They also use recycled PET to make PET strapping and individual recycled bristles for brooms and brushes – a truly versatile plant. 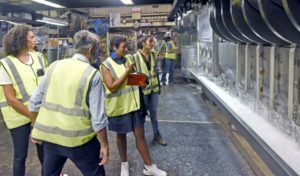 After the plant tour, the attendees gathered in the boardroom for a round-table question and answer session about all things recycling, packaging, plastic and waste in South Africa. Feroz Koor, the Group Head of Sustainability at Woolworths spoke from a retailer perspective on packaging and recycling in South Africa. Koor said, “The Woolworths in Pinelands has had a decline in the demand for plastic shopping bags.” He also elaborated on other insightful and pro-active measures that Woolworths is taking to achieve their Good Business Journey plans. See more pics of the day here. See PETCO’s Design for Recycling guidelines here. 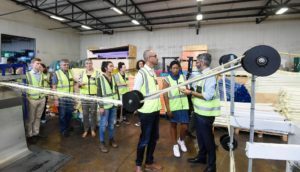 *Key members in attendance were PETCO, Woolworths, TWYG, The Beach Co-Op, The Greenhouse, Two Oceans Aquarium, Divine Intervention, Yacht Boaz and WWF-SA.